I love trying new cafes and restaurants in Kigali and love it even more when the place impresses me. I have to admit that I often go to new places with a bit of a dubious attitude, due to being disappointed many times before by businesses that really aren’t ready yet to serve customers. I’m pleased to say that things in Kigali have improved a lot in the past few years and I’ve been repeatedly impressed by new restaurants and cafe in the city. Acacia Book Cafe is another impressive new addition to Kigali’s growing cafe scene. Though small, Acacia Book Cafe has a lot going for it. They have a well-lit, airy space with comfy seating and their chalk board menu is a nice touch. Plus they have a nice selection of smoothies, coffees, and some breakfast and lunch options. One thing I really love about Acacia Book Cafe is their obvious joy for sharing a love of reading. The name should have been a tip off but if that doesn’t make things clear enough, there’s a whole wall dedicated to books and they also host reading events fairly regularly. The books are available for sale or they’ll lend them out to you library-style which, I think, is a really great thing. There are probably a couple of hundred titles with a few fiction titles (like the Hunger Games series), some Africa-focused non-fiction, and a large selection of Christian books. Though the cafe is small, they have a pretty diverse menu and manage to make some very tasty food. Their chocolate waffle is pretty amazing and, at Rwf 2,500, it’s one of the best deals in the city. Their Strawberry Squeeze smoothie with a mix of strawberries, bananas, and milk (Rwf 3,000) is one of my favourite drinks in Kigali. 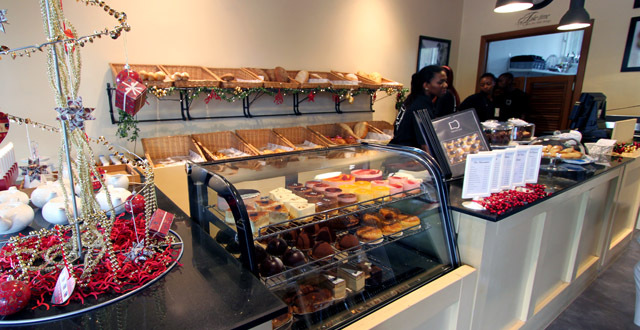 They also do a very nice mocha (Rwf 3,000) and offer an iced option for all of their coffees and teas. They have a selection of fresh juices for Rwf 2,000 too. Add in a Spanish omelette, other varieties of waffles (Rwf 2,500), crepes (Rwf 1,500), and a salad (Rwf 2,500) and you have a nice choice for light meals, all at extremely affordable prices. I’m usually pretty dubious of sandwiches in Kigali. There’s only so many times you can eat the same version of a sandwich in different cafes and restaurants around town. So I rarely look forward to the ‘but I have to try a sandwich to write my review’ sandwich. They fill me with dread, actually, and Acacia was no different. I wasn’t really looking super forward to trying their chicken sandwich, fearing it would be like all the rest, but they totally came through for me! They make a mean chicken sandwich and I’d totally recommend it. Sure, they have all of the usual ingredients – chicken, that lettuce you get everywhere, tomato, and the inescapable gouda – but theirs is more of a chicken salad style sandwich where the meat is mixed into a mayonnaise concoction. Surprisingly yummy! What really sets it aside, though, is the bread. The sandwich is on a baguette which certainly isn’t unusual but the bread was super fresh and the extra little touch of giving it a light toast in the panini maker really set it apart. I’m a fan. Due to countless Kigali-wide disappointments, baked goods also make me nervous. I haven’t tried them here yet (I’m always too full due to their generous helpings) but they have a small selection of donuts that I’ll have to sample sometime soon. The quality of their other offerings gives me hope! The service here is very low key but manages to be quite professional. They think of the little things like bringing a cup of ice because the water they have isn’t as cold as they think it should be. Or quickly nipping out to buy an ingredient that they’ve run out of if it’s needed for your order. I’ve never had any issues with my order or the bill and things com out quickly and without any surprises. The food and drinks here is consistent and that’s something that can be tricky to find at a small cafe or restaurant in Kigali. Acacia Book Cafe is a great little place and I can’t recommend it enough. 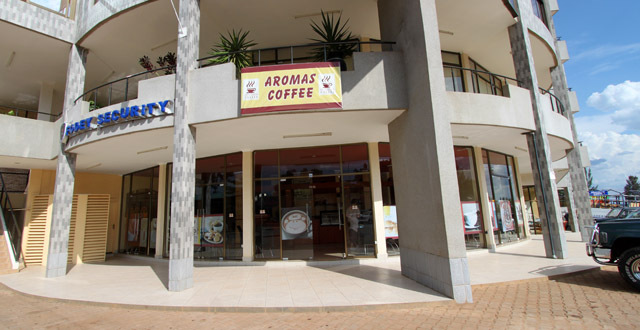 It’s a relaxed oasis in the hustle bustle of Remera and I’ve always had a nice experience here. It it weren’t so far away from my house I’d likely be here a lot more. The owner is often around and is very nice and the whole vibe of the place is friendly… the sort of place I actually want to give my business to. Check them out and leave a comment below! I’d be curious to hear what you think. the food is yummy, it’s quite a nice comfy place. Very Amazing place to relax and grab a cup of coffee and a book. Being in the book sector, I love the creativity of a book cafe, I cannot count the number of times I have visited and enjoyed the hot chocolates, Definitely a nice place to check when you are in kigali.